Home Culture	Fast Food pasta? The existence of these restaurants puts me in mind of the protests which took place in Rome in 1986 against the opening of the first MacDonald’s restaurant in Italy. People served spaghetti to passers-by as if to point out that Italy already had its own fast food and that imports were not needed. These new restaurants seem to me an almost if-you-can’t-beat-them-join-them reaction to the still-growing number of cheap food outlets in city centres. Traditionally the Italian reaction to fast food has been to emphasize that quality food takes a long time to cook. This led to the establishment of the Slow Food movement in 1989, just three years after the golden arches arrived in the peninsula. This idea has become so influential and popular that today many pizza restaurants advertise that their dough has been allowed to rise for 72 hours. The cooking of pizza may be fast but there’s a whole slow process behind it. In theory, the idea of fast-food pasta is the same. The actual pasta and the sauces take a long time to prepare, but the final cooking is very fast. Fresh pasta can be cooked literally in a couple of minutes. You could slow cook a lovely ragù and serve it with tagliatelle cooked to order. The pasta takes about two minutes to cook in boiling water, and so from order to eating the whole process could be under five minutes. What could go wrong? Last weekend, I decided to try out a few of these fast-food pasta restaurants in order to write a review. However, I had such an awful experience at the first one I tried that I abandoned the idea. I prefer to write positive reviews of places rather than negative ones. If I visit a restaurant I don’t like, I just don’t review it. This was just so awful, however, that I felt I needed to write something, although I am not going to name the restaurant. My first impressions were favourable. The restaurant, had a limited variety of fresh pasta on offer with a limited number of mostly appropriate sauces. (Remember that Italians are very particular about which sauce can be served with which pasta, based on years of history, tradition, regionalism, and taste.) I decided to not be controversial and so ordered tagliatelle with ragù. The restaurant also had a decent sized area inside to eat and so was not encouraging people to eat in the crowded streets. First impressions were not good as the box was only about half full. This gave the impression that it was not worth the price. There were only a few minutes between my ordering and receiving the pasta, which boded well. I moved into a corner of the restaurant clutching my little box and plastic fork and opened the lid. The box, which was small, was only half full and created a very sad initial impression. However, I thought that this probably represented a normal portion size of 80g pasta, so I wasn’t that worried. When I tried to eat the pasta however, I discovered the real problem. The pasta was scotta. Overcooked, but badly. This meant that not only did it taste awful, but it was almost impossible to eat because it disintegrated when you tried to wrap it around the fork. This was a real pity, because the ragù was not bad at all. It’s easy to overcook fresh pasta as it only requires a couple of minutes in boiling water. When it’s overcooked it falls to pieces and is almost impossible to wind around the fork. I felt bad after this experience. Not only because I had wasted over €8 which I could have spent in one of Venice’s hidden-gem restaurants on a nice plate of bigoli in salsa, but also because the person who had cooked the pasta felt that this was acceptable. Furthermore, this was the impression that visitors to Venice were going to have of one of the jewels in Italy’s culinary crown. I am not saying that you shouldn’t eat in one of these places. This article is based solely on my experience of one of them. If I had had the courage to continue my research, I may have found that other restaurants were doing a sterling job. I firmly believe that, done well, there’s no reason why such a restaurant couldn’t be good. But I found the whole experience too depressing. I have had bad pasta outside Italy, but I have always said (and still do say) that it’s very difficult to eat badly almost anywhere in Italy. This was, however, the worst pasta I’ve actually paid for anywhere. It’s depressing that any Italian felt that it was acceptable to serve this as I am sure none of them would have enjoyed eating it. I hope it’s not a sign of the times. 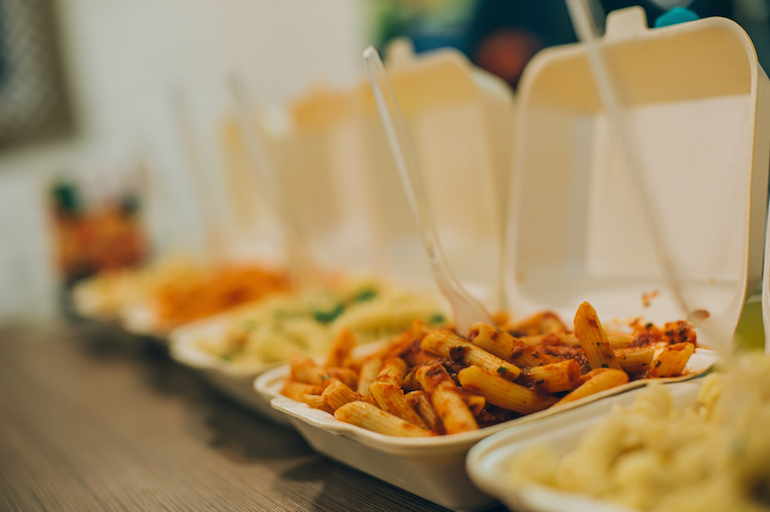 Have you tried out an Italian fast food pasta restaurant? Did you have a good experience? I’d love to hear about it in the comments. I think it’s a mixture between privately owned and chains. There are plenty in Venice. , Thank you Luca, I’ll bear that in mind. I may have a change of heart when I’m there next year; time will tell. If you do and have a positive experience, let me know. Hi Luca, We ate at a place called Sugo Padova (via del Santo7, Padova) about 2 weeks ago on a Sunday at lunch time. The pasta was fresh and cooked correctly – servings of 90 gms with different selections of sauces. Service was slightly slow but otherwise everything was excellent & we spent €13 for 3 people. Now that doesn’t sound too bad at all. As I said in the article, there’s no reason why it shouldn’t be good if done properly. It sounds like they’ve got it right there. Like you, my first experience was so disappointing, I never tried “fast pasta” again. This was also in Venice, a few years ago. Era veramente una cosa brutta. Non l’ho finita. At the hotel where I work at the reception (not far from San Marco), just last week, a young North American woman that had obviously done a great deal of research and dedicated a great deal of energy to her planning (via Internet and the usual travel sites) of the trip and asked some additional questions, was deeply offended when she asked if I “liked” the place she intended to go, I frowned at her plan to eat at one of these establishments for the couple’s first “dinner” in Venice, and tried suggesting instead a couple traditional bacari or a rosticceria (much to appreciation of the husband) if they didn’t want to spend the time for a sit down meal. She also had a plan to go to trek all across town the next day to go to Bacareto da Lele, even though it was the only thing in the area, because it was “a top restaurant in Venice from Tripadvisor reviews”, and barely spoke to me after I tried explaining that there were many valid and delicious bacari much closer to some of the other things they were planning to see (like the Ghetto and going to Murano – ie: Fondamente Cappusine/Ormesini/Misericordia before catching the 4.2 with normal Venetians at Sant’Alvise or Madonna dell’Orto).